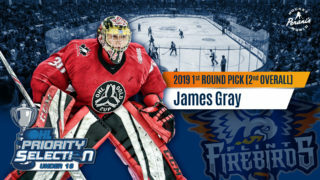 Flint, Mich. – Flint fought back to tie the score three times in a very physical battle with North Bay, but the final score favored the visitors 5-3. For the Firebirds, Ty Dellandrea (Dallas Stars), Hunter Holmes and Eric Uba lit lamp. Between the pipes, Emanuel Vella stopped 20 of 25 shots. North Bay’s Justin Brazeau and Adam McMaster each scored twice and gained two assists for a four-point night. The Firebirds controlled the puck and the flow of the game for the first several minutes, executing crisp passes and generating the first four shots on net in the contest. A turnover in the neutral zone, however, led to North Bay’s first scoring opportunity. Adam McMaster poked the puck free from a Flint skater and finding teammate Justin Brazeau streaking up the right-wing boards with a stride advantage on the nearest Firebird. From inside the right circle, he sent a wrist shot far-side. The puck found twine just above netminder Emanuel Vella’s right shoulder for Brazeau’s third of the campaign at 4:13 of the first period. After one, the Troops held the edge on the scoreboard, 1-0. Flint controlled the shots-on-goal through 20 minutes 15-6. Captain Ty Dellandrea tied the game 42 seconds into the second period. Ryan Bangs picked up the puck behind his own goal. He skated out to his right and connected a breakout pass to Jake Durham. Durham carried into the neutral zone, then made a cross-ice pass onto the stick of his captain. Dellandrea carried into the Flint zone, flashed a hip shake and cut 90 degrees to his right, before firing a quick wrister past North Bay goaltender Christian Propp. The goal was Dellandrea’s second of the season, extending his point-streak to three games. Jake Durham threw down the mitts with Cole Cameron in defense of his teammate after a physical play in the neutral zone. Moments later, Dellandrea generated and all-out breakaway for himself. He attempted a shot five-hole on Propp that was sent wide by the netminder’s left pad. The Battalion struck again, this time on the power-play, to quiet the frenzied crowd and reclaim the lead at 6:17. Brad Chenier carried the puck between the circles and dished a backhand pass to Brazeau streaking through the left-wing circle. As he crossed the face-off dot, he lifted a wrister top-shelf, near side. The marker was Brazeau’s second of the evening and seventh of the season. Brandon Coe picked up his fourth assist of the season with the second helper. Hunter Holmes evened the score at two with his second of the season at 11:31 of the second. Ty Dellandrea picked up the puck along the right wall in his defensive zone. He made a tape-to-tape pass across center ice to Holmes motoring up the left-wing side. Dellandrea joined the two-on-one attack from the right. Holmes briefly looked to pass, then made a half-spin, allowing to fire an ice-level shot that beat both the rearguard and goaltender. Dellandrea gained his second point of the night with the lone assist. Adam McMaster put the Troops back on top at 17:10 of middle stanza with his third of the campaign. He buried a wide-angle shot from the bottom of the right-wing circle that found its way between Vella and the near post. Brazeau and Nick King assisted on the goal. Early in the third period, North Bay used their one timeout to strategize for a 1:54 of five-on-three. The Firebirds’ penalty-kill stood strong, assisted by some stellar saves by their veteran netminder. Both penalties were killed successfully and Flint went back into offensive mode. 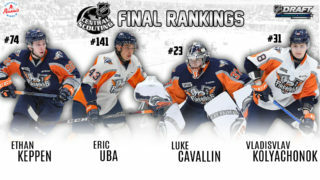 At 9:28 of the third period, Eric Uba earned his second career OHL goal in as many games. First-year blue-liner Michael Bianconi blasted a howitzer from the left point that was knocked down by Propp in front of his goal crease. Ethan Keppen and Uba attacked the loose puck, with the latter finding paydirt from the doorstep. Bianconi and Keppen earned the assists. The Battalion once again went up by a goal on McMaster’s second of the game and fourth of the season at 12:02. Chenier and David Maier were given the assists on the power-play marker. Flint pulled Vella and used their team time-out with just under a minute in regulation. Vella was put back in net, as the ensuing face-off was deep in the defensive end. The Battalion managed one shot right off the draw that was saved by Vella, but the rebound was sent past the sprawling goalie and in for Chenier’s second of the season. Brazeau and Simon Rose assisted on the play. The Firebirds outshot the visitors by a margin of 38-25. In the face-off circle, Flint won 35 draws to North Bay’s 26. The scoreboard, however, reflected a 5-3 victory for the Battalion. 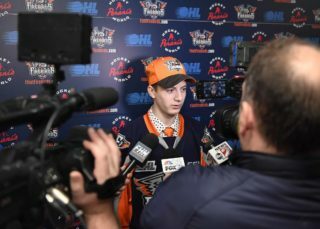 Up Next: The Firebirds welcome the Kitchener Rangers to Flint on Saturday for the annual “First Responders Night” sponsored by Dort Federal Credit Union. Join us in thanking all first responders for their dedication to our community. First responders with valid identification will receive $5 off of a $16 Silver Level ticket. Admission to the Firebirds’ game earns fans a ticket to the ‘Battle of the Badges’ game between the Police & Firefighters that takes place beginning at 4 p.m. with doors set to open at 3:30 p.m. Pre-game festivities include the annual “Save-a-Life” Expo from 5-6:45 p.m. at the Dort Federal Event Center’s second arena. The event is FREE to the public. Fire trucks, police cars and emergency medical service (EMS) ambulance vehicles will be available for the public to observe and experience. Fans will be able to enter and explore the vehicles and display trailers. Hands on demonstration, giveaway items and training from various participating fire responder branches will take place throughout the event.